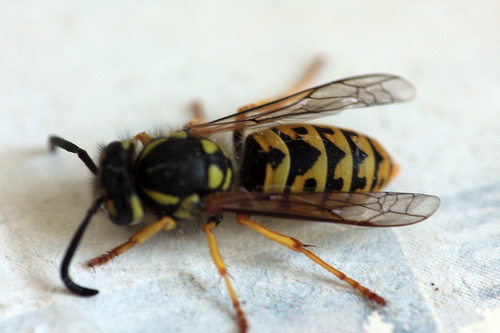 Wasp, hornet and yellow jacket stings can be life-threatening to persons who are allergic to the venom. People who develop hives, difficulty breathing or swallowing, wheezing or similar symptoms of allergic reaction should seek medical attention immediately. Itching, pain and localized swelling can be somewhat reduced with antihistamines and a cold compress. Wasps, Hornets, Yellow Jackets, Honey Bees, Bumble Bees, Ground Bees, Carpenter Bees, Paper Wasps, Cicada Killers, Sand Wasps, and other related insects will establish their nests and hives in and on homes, commercial buildings, sheds, gazebos, walls, fencing, etc. As many people have discovered, nesting frequently occurs underground (Bumble Bees and especially Ground Bees, a type of Yellow Jacket) and in vegetation such as shrubs, trees and ground cover (Hornets & Yellow Jackets). All of the above prove a threat to the safety of people and pets and can even prove fatal to those who are allergic to their venom. The 24/7 emergency service provided by Bee Control exists to help you deal with the above. Bee Control has evolved and grown through the ability to contend with the many complicated and dangerous situations created by stinging insects, their nests, hives and swarms. Situations that Bee Control is organized to deal with 24/7 and get rid of your problem. Immediate response is always available. On arrival we locate and eliminate the nest, totally removing the nest when physically possible. EPA approved materials and methods acceptable to the Washington Dept. of Agriculture are used to ensure maximum safety & effectiveness. Free Over The Phone Estimates!